If ever MS Dhoni wants to take up a coaching job, he is certainly getting some practice as he mentors Jharkhand in the All India Buchi Babu Invitation Tournament. He may still have some time to go before he calls time on his career, but no doubt his seniority and experience will be of immense help to the Jharkhand player. 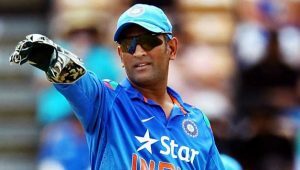 This will be Dhoni’s first official assignment as a mentor, even though he is highly regarded by his teammates in the state, national and franchise sides as a great motivator and strategist. He doesn’t have much cricket at the moment as India are playing Tests. Dhoni quit the longest format in late 2014. Virat Kohli has been leading the team since then. He will be back in action later this month when India and West Indies play two T20Is in US. The 35-year-old will look to get some valuable practice with the Jharkhand boys and get into the groove of things. He last played against Zimbabwe which was almost 2 months ago.